Farm and Livestock auction software – designed for Auctioneers, Vendors, Agents and Saleyard Operators. Live stream auctions from your own website. Bidders can now bid absolutely App-Free on all mobile devices for all auction formats. New *HD video and social media options now available. If you’re a traditional livestock auctioneer, it’s time to modernise your business. As word spreads about the Webtron online auction solution, more and more industries are realising the benefits. And the agricultural and livestock sector is no exception. With many livestock auction events in remote areas, it’s not always feasible for bidders to be present. But with Webtron, you can attract a vast bidding audience, no matter how far away from your auction event. Livestock auctions lend themselves particularly well to either live webcast or timed auction format. With years of experience in this industry, Webtron understands the challenge of running live auction events in remote locations and with limited resources. And if you don’t have an internet connection at your auction location? That’s no problem. Our advanced remote clerking solutions make almost anything possible. More hands make light work with the Webtron Photo Manager. 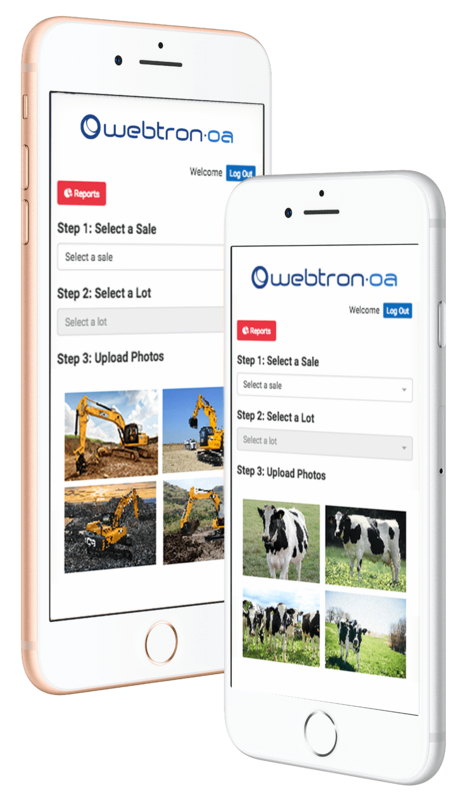 The Webtron Photo Manager simplifies the way livestock auctioneers add photos to sales. This multi-user app permits you to snap and link photos to your sale using your mobile device. No internet connection? You can take photos out on location, and upload your photos to the sale once you’re back in range. It’s now just that quick and easy. Imagine the time you can save? For a turnkey online auction solution for your livestock auctions, Webtron farm and livestock auction software is the answer. Contact us for a free software demonstration today.